Post Doctoral Fellow, Texas Institute for Computational Mechanics, University of Texas at Austin, 1973-1974. Ph.D., Engineering Mechanics (Advisor: Dr. J. T. Oden), University of Alabama in Huntsville, Alabama, 1973. M.S., Mechanical Engineering, Oklahoma State University, Stillwater, Oklahoma, 1970. B.E. (5yr Course), Mechanical Engineering, Osmania University, Hyderabad, Andhra Pradesh, India, 1968. Reddy is known worldwide for his significant contributions to the field of applied mechanics through his pioneering works on the development of shear deformation theories (that bear his name in the literature as the Reddy third-order plate theory and the Reddy layerwise theory) and the authorship of widely used textbooks on the linear and nonlinear finite element analysis, variational methods, composite materials and structures, applied functional analysis, and continuum mechanics. His writings have had a major impact on engineering education and technological advances around the world. 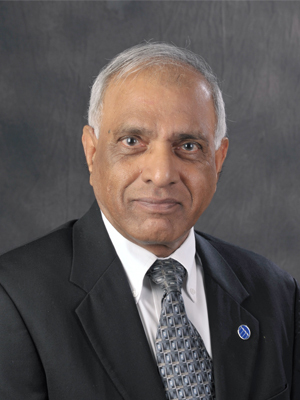 Dr. Reddy’s research over the years has involved the development of dual-complementary variational principles in theoretical mechanics, mathematical theory of finite elements (especially mixed finite element formulations), refined mathematical models of laminated composite plates and shells, penalty formulations of the flows of viscous incompressible fluids, least-squares formulations of solid and fluid continua, and extensions and applications of the finite element method to a broad range problems, including: composite structures, numerical heat transfer, computational fluid dynamics, and biology and medicine. His shear deformation plate and shell theories and their finite element models and the penalty finite element models of non-Newtonian fluids have been implemented into commercial finite element computer programs like ABAQUS, NISA, and HyperXtrude. The current research of Dr. Reddy and his group deals with 7- and 12-parameter shell theories and non-local and non-classical mechanics theories using the ideas of Eringen, Mindlin, Koiter, and others. Dr. Reddy and Dr. Srinivasa have conceived a transformative non-parametric network based methodology (called GraFEA) to study damage and fracture in elastic and viscoelastic solids, including composite structures. The JN Reddy Medal in Mechanics of Advanced Materials and Structures, Inaugural Recopient. The JS Rao Medal in Vibration Engineering 2017, The Inaugural Recipient. Foreign Fellow, Brazilian Academy of Engineering, November 2017. The John von Neumann Medal, The US Association of Computational Mechanics; it is the highest award given by USACM to honor individuals who have made outstanding, sustained contributions in the field of computational mechanics generally over periods representing substantial portions of their professional careers. Foreign fellow, The Canadian Academy of Engineering, 2017. The John von Neumann Medal, The US Association for Computational Mechanics, 2017. ASME Medal, The American Society of Mechanical Engineers, 2016. Thomson Reuters IP and Sciences Web of Science Highly Cited Researchers - Most Influential Minds, 2016. Prager Medal, Society of Engineering Science, 2016. Inducted into the Hall of Fame of the College of Engineering, Technology, and Architecture at Oklahoma State University, 2015. Foreign Fellow, the Indian National Academy of Engineering, September 2015. Member, US National Academy of Engineering (NAE), Washington, DC, 2015. Md. M. Rahaman, B. Dhas, D. Roy, and J.N. Reddy, "Variational formulation for dissipative continua and incremental J-integral," Proc. Royal Society A, Vol. 474, 20170674. Md Tauhidul Islam, Anuj Chaudhry, Ginu Unnikrishnan, J.N. Reddy, and Raffaella Righetti, "An analytical poroelastic model for ultrasound elastography imaging of tumors more permeable than surrounding tissues," Physics in Medicine and Biology, Vol. 63, No. 2, article 20170674, Jan 2018. Archana Arbind and J.N. Reddy, “A general higher order one-dimensional theory for analysis of solid body in cylindrical co-ordinate system and it's nonlinear finite element model for large deformation,” Computer Methods in Applied Mechanics and Engineering, Vol. 328, pp.99-121, 2018. Arun Srinivasa and J.N. Reddy, "An overview of theories of continuum mechanics with nonlocal elastic response and a general framework for conservative and dissipative systems," Applied Mechanics Reviews, Vol. 69, 10.1115/1.4036723, May 2017. Parisa Khodabakhshi, J.N. Reddy, and Arun Srinivasa, “GraFEA: A graph based finite element approach for study of damage and fracture in brittle materials,” Meccanica (50th Anniversary Volume), Vol. 51, No. 12, 3129-3147, Dec 2016. J.N. Reddy, Principles of Continuum Mechanics. A Study of Conservation Principles with Applications, Cambridge University Press, New York, 2010; 2nd ed., 2017. Translated into French and published in 2015 by De Boeck Superieur. J.N. Reddy, An Introduction to Continuum Mechanics with Applications, Cambridge University Press, New York, 2008; 2nd ed., 2013. J.N. Reddy, An Introduction to Nonlinear Finite Element Analysis, Oxford University Press, Oxford, U.K., 2004; 2nd ed., 2015. J.N. Reddy, Theory and Analysis of Elastic Plates and Shells, Taylor & Francis, Philadelphia, PA,1999; 2nd ed., 2007. J.N. Reddy, Mechanics of Laminated Composite Plates and Shells: Theory and Analysis, CRC Press, Boca Raton, FL, 1996; 2nd ed., 2004. J.N. Reddy, Applied Functional Analysis and Variational Methods in Engineering, McGraw-Hill, NY, 1986; reprinted by Krieger, Melbourne, FL, 1991. J.N. Reddy, Energy Principles and Variational Methods in Applied Mechanics, John Wiley, NY, 1984; 2nd ed., 2002; 3rd ed. 2017. J.N. Reddy, An Introduction to the Finite Element Method, McGraw-Hill, New York, 1984; 2nd ed., 1993; 3rd ed., 2006; 4th ed., 2019.